DDA Presents the Most Advanced Medical Equipment Provider in the Most Advanced Way, Website Design and Development for Galil Medical. 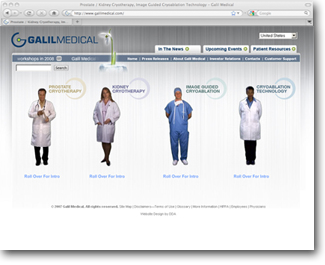 DDA designed this website for Galil Medical in 2007 using website spokeperson videos and Flash techniques. This site provides information about the minimally invasive cryotherapy solutions for prostate and kidney cancer. The site is divided into four main sections: prostate cryotherapy, kidney cryotherapy, image-guided cryoablation and cryoablation technology. This second website DDA built for Galil Medical, the leading device manufacturer in the cryotherapy for oncology arena, is a highly innovative and interactive web experience. The homepage features four clinician actors with rollover introductions and click-through video explanations, each providing educational information on a different category, an on-demand media center, a clinician-specific information layer, and custom high-tech graphics, all combined together to present the most advanced medical equipment in the most advanced website platform.